Place all of the above ingredients in a saucepan and bring to a boil. Set aside for 10 minutes to infuse. Shuck oysters, making sure that there is no shell left behind. 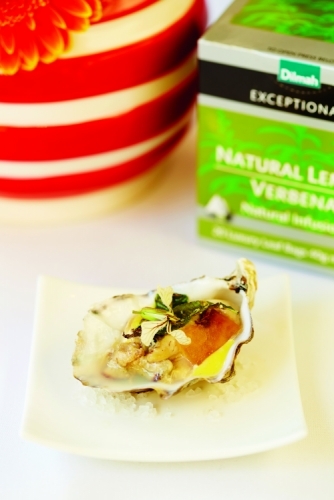 Bring the lemon verbena liquid back to a boil and add the oysters and set aside to cool. Place yolks and vinegar in a food processor and blend on high. Keep blending until the yolks have doubled in volume. Slowly add the saffron infused oil, making sure to not add it too quickly. Add the pre-soaked gelatine and pour into a plastic container.